A regular breeding resident and migrant. Individuals have been recorded lingering into early winter in southern Minnesota usually along the Mississippi River. The Osprey was uncommon during the Minnesota Breeding Bird Atlas (MNBBA). Ospreys have a worldwide breeding distribution and are found across the Northern Hemisphere, including all of Eurasia and North America. Coastal resident populations are found in Australia and the South Pacific. Widely distributed across North America, especially in areas near water, such as along the Atlantic, Great Lakes, and Pacific coasts. Rare or localized in the central United States and Canada in open areas that lack water. Highest densities are found in Florida and the Chesapeake Bay region (Figure 1). A short- to long-distance migrant that winters along the southern Atlantic coast and the Pacific coast, in Florida, along the Gulf coast, and in the West Indies, coastal Mexico, and Central and South America (Martell et al. 2001). Exclusively a fish-eating species, which often hovers before diving, feet first, into the water to grab a fish. Natural or artificial structures usually at the top of trees, rocky cliffs, towers, utility poles, channel markers, or poles erected specifically for Ospreys. Common features include proximity to water in good feeding areas, openness allowing easy access to nest, safety from predators, and sufficient width and stability to accommodate a large nest. Nests are often reused each year. Breeding distribution and relative abundance of the Osprey in North America based on the federal Breeding Bird Survey, 2011–2015 (Sauer et al. 2017). With all the water in Minnesota, the Osprey is a well-known and spectacular fish-eating icon. The species has had a rocky history during the past 150 years. Roberts (1932) stated it was a “summer resident, breeding throughout the wooded portion of the state. Formerly common now becoming scarce.” Roberts suggested its decline in the early 1900s was due to indiscriminate shooting of the birds; even though it was eventually protected, isolated shooting still occurred. Roberts surprisingly documented few nests in his 1932 treatise on the birds of Minnesota. He reported confirmed nesting in Aitkin, Cook, Lake, and St. Louis Counties and in Itasca State Park. All the nests were observations of young in the nest or just out of the nest, except Cook County, which was of a nest in a Great Blue Heron colony. In his 1936 revision, Roberts included 1 nest with eggs in Crow Wing County, and 2 nests in Lake of the Woods County, one of which he labeled as unusual because it was in a live spruce tree. Roberts (1932, 1936) largely attributed the decline of the Osprey to illegal shooting and potential negative interactions with Bald Eagles. Evans (1982) pointed out that interspecific aggression occurs with Bald Eagles but cited evidence that actual predation was infrequent. Even though the population of Ospreys was not large after the 1930s, it declined further when DDT entered the environment in the 1950s and 1960s. Massive egg-shell thinning and poor reproduction substantially reduced the population in Minnesota and throughout North America (Poole et al. 2002). In 1975, Green and Janssen reported that Ospreys were “resident in north central and northeastern Minnesota and adjacent Becker, Mille Lacs, and Pine Counties.” Even though Ospreys had been observed in the Upper Mississippi National Wildlife and Fish Refuge in southeastern Minnesota, no nests had been located in that region of the state. Green and Janssen reported confirmed nesting in 15 counties. Besides the 7 already reported by Roberts, they included Becker, Beltrami, Carlton, Cass, Clearwater, Hubbard, Mille Lacs, and Pine Counties. Johnson (1982) stated that during the 1981 breeding season there were an estimated 160 “producing” osprey nests in the state. Producing nests were defined as those when at least 1 young survives to fledging age. He included nests from the Chippewa and Superior National Forests and an incomplete inventory of Crow Wing, Becker, Mahnomen, and Hubbard Counties. About 25 of the nests were on artificial structures. A majority of the nests in Minnesota, 70% (112 of 160), were in the Chippewa National Forest due to the diligent efforts of John Mathisen, the wildlife biologist on the Chippewa, who led the effort to document nesting. Johnson reported Osprey nesting data from the Chippewa National Forest from 1968 to 1981, where the number of active nests varied from a low of 40 in 1968 to a high of 142 in 1980. Nesting success varied from a low of 13% in 1968 to a high of 65% in 1980. Johnson reported nesting from 17 counties; new nesting records were reported from Mahnomen County, and a nest with 1 young was reported from Lake Bronson State Park in Kittson County. In 1983, Coffin and Pfannmuller (1988) stated that Henny had estimated the entire contiguous U.S. population as only 8,000 pairs. In 1984 and 1985, Hennepin County Parks initiated a program to restore breeding populations of Osprey to the Twin Cities area. In his 1987 update, Janssen reinforced that the Osprey breeding distribution in Minnesota was in the north-central and northeastern regions and west to Mahnomen County. He confirmed nesting in 15 counties since 1970 with most in northeastern and north-central Minnesota. Besides those previously reported, he extended confirmed nesting south to Carver and Kanabec Counties and west to Mahnomen County. By 1998, Hertzel and Janssen had added 4 more counties to the list since 1970 including a southern extension to Winona County and west to Otter Tail County, and nesting in Anoka and Todd Counties. The Minnesota Biological Survey (MBS) began their surveys in the late 1980s and have currently recorded 79 breeding season locations. Their locations are primarily in north-central and northeastern Minnesota but extend to Kittson, Marshall, and Pennington Counties in the northwest and to Kandiyohi County in the west-central region, and include 1 location in Freeborn County in the southern tier of counties. A statewide survey conducted by the Minnesota Department of Natural Resources in 2004 found around 600 nesting pairs, concentrated in the north-central portion of the state. The results of the intensive efforts by MNBBA participants illustrate the massive recovery by the Osprey since the 1950s and 1960s. The MNBBA reported 938 records, which included 12.9% (618/4,791) of the surveyed atlas blocks and 10.5% (246/2,337) of the priority blocks. Confirmed nesting was identified in 397 blocks, probable in 15 blocks, and possible in another 120 blocks (Figures 2 and 3; Table 1). This distribution represents the continued expansion of the population described by both Green and Janssen (1975) and Janssen (1987) to Otter Tail and Douglas Counties, and a possible nesting in Lac qui Parle County in the west. The MNBBA reported confirmed nesting in 34 counties, including southwest to Watonwan County, south to Le Sueur County, and southeast to Winona County. The reintroduction program in the Twin Cities metropolitan area in the 1980s and 1990s greatly expanded breeding in the area and southward (Gillette and Englund 1985). The high density of nesting records in the metropolitan area, in central Minnesota, and in western Becker and Otter Tail Counties is a testament to the recovery of the Osprey and to the dedication of MNBBA participants in those regions. The landcover suitability map for the Osprey highlights the extensive lakes region of central, west-central, and east-central Minnesota (Figure 4). In addition, several riverine systems are well represented. Since the banning of DDT in 1972, Ospreys have again been expanding their range in Minnesota, presumably to some of their formerly occupied territories. Roberts pointed out that shooting Ospreys had reduced their populations into the 1930s. Even with passage of laws protecting migratory birds that occurred between the 1930s and the 1960s, Osprey populations were unlikely to be large, because raptors were shot well into the 1950s. DDT use in the 1950s and 1960s further reduced its populations. Today the Osprey has substantially recovered, though many threats still exist or are emerging. In their North American review of the Osprey, Bierregaard et al. (2016) point out that not only did the banning of DDT aid the species, but many management efforts were also important to its recovery. For instance, reintroduction programs, construction of artificial nesting structures, and the creation of reservoir habitats have aided the expansion into formerly unoccupied areas. The recovery of Osprey populations is also well documented in surrounding states and provinces, including Michigan (Chartier et al. 2013), Ontario (Cadman et al. 2007), and Wisconsin (Cutright et al. 2016). Breeding distribution of the Osprey in Minnesota based on the Breeding Bird Atlas (2009 – 2013). Summary statistics of observations by breeding status category for the Osprey in Minnesota based on all blocks (each 5 km x 5 km) surveyed during the Breeding Bird Atlas (2009-2013). Summary statistics for the Osprey observations by breeding status category for all blocks and priority blocks (each 5 km x 5 km) surveyed during the Minnesota Breeding Bird Atlas (2009-2013). Landcover suitability of the Osprey in Minnesota based on habitat, landscape context, and climate data gathered during the Minnesota Breeding Bird Atlas (2009-2013) using the MaxEnt modeling approach. The Osprey is a water-loving species with numerous opportunities for nesting in Minnesota. It is found widely near lakes and rivers where suitable nesting sites exist. Ospreys have also adapted well to living in close association with people. They nest in a variety of locations near water with accessible fish and nest sites free from predators. Poole et al. (2002) found that Ospreys will commute up to 10 to 20 km for food in shallow water (0.5–2 m deep). Beaver activity can be beneficial to the Osprey if dead snags for nesting are created along with shallow ponds with available fish. Natural nest sites include trees, cliffs, large boulders along shorelines, and especially sites on predator-free islands (Bierregaard et al. 2016). When in trees, Osprey usually nest at the top of the tree. As previously noted, many artificial nest sites are also used, including towers, power poles, buoys, channel markers, duck blinds, and poles erected specifically for Ospreys (Figure 5). Ground nesting is also known where mammalian predators are absent, such as on Gardiners Island, New York, where approximately 300 pairs historically nested. Primary predators are mammalian (e.g., raccoon), but Bald Eagles and Great Horned Owls are known to prey on nestlings, and Great Horned Owls on adults. Typical breeding habitat of the Osprey (© Gerald J. Niemi). Osprey populations have varied considerably over the past 100 years in Minnesota. Partners in Flight estimated the North American population as 310,000 (Rosenberg et al. 2016). They also estimated that the Osprey population in North America had increased by more than 200% from 1970 to 2014. Population estimates for Canada were much broader and ranged from 50,000 to 500,000 adults (Environment Canada 2011). Partners in Flight (Partners in Flight Science Committee 2013) estimated the population in Minnesota as 1,100 individuals. The MNBBA did not attempt to estimate the population of Ospreys in the state. The federal Breeding Bird Survey’s (BBS) roadside method is generally unreliable for detecting species like the Osprey. However, the method was reliable for Florida, where trends for 75 BBS routes showed a significant increase in the Osprey population from 1966 to 2015 of 3.07% per year (Sauer et al. 2017). Though the trends survey-wide in the United States and Canada should be interpreted with caution, the data show that the population was significantly increasing by 2.54% per year over the same time period, based on 1,001 routes. 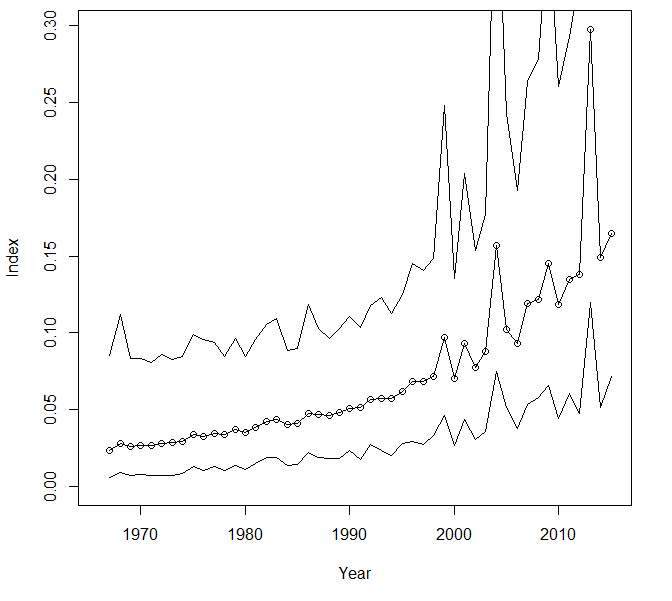 In Minnesota, the number of detections of Osprey was relatively low from 1967 to 2015 but showed a nonsignificant increasing population of 4.04% per year along with high variability (Figure 6). The trend in Minnesota was relatively steady from 1967 to the early 1990s and then began to increase substantially to 2015. 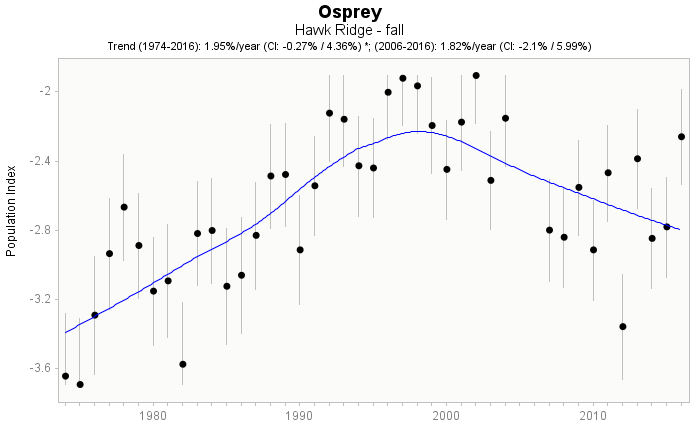 The Osprey trend based on fall migration counts at Hawk Ridge in Duluth, Minnesota, indicated a nonsignificant increase from 1974 to 2016 of 1.95% per year. The recent trend from 2006 to 2016 has been stable, but there has been an overall downward trend since 2003 (Figure 7). Breeding population trend for the Osprey in Minnesota for 1967–2015 based on the federal Breeding Bird Survey (Sauer et al 2017). Fall migration counts of the Osprey at Hawk Ridge, Duluth, Minnesota, as calculated by the Raptor Population Index from 1974 to 2016. The Osprey was assigned a relatively low score of 7/20 by Partners in Flight (2017), primarily because of its recent increasing population and its very broad geographic range. In Minnesota, Ospreys were officially listed as a Special Concern Species in 1984 but delisted in 1996. They were also formerly listed as a Species in Greatest Conservation Need but have been removed from this list (Minnesota Department of Natural Resources 2015). Current Osprey populations may be among the highest in over 100 years. Poole et al. (2002) and Bierregaard et al. (2016) identified many potential emerging problems for the Osprey, including land conversion of forests to agriculture with loss of nest trees and increased turbidity in foraging waters, continued shooting on wintering grounds and at fish farms, automobile collisions, ingestion of lead and plastics, and chemicals, such as mercury and other organochlorine compounds. Bierregaard et al. (2016) emphasized the many positive effects that management and conservation activities have had and can continue to have on Ospreys. These activities include (1) creation of reservoirs and waterfowl impoundments; (2) protection and improvement of water bodies, such as controlling water levels that are favorable to foraging Ospreys; (3) reintroduction programs that introduce Ospreys to new areas; and (4) most important, providing Ospreys with artificial nest sites, which has led to dramatic increases in Osprey numbers. Langham et al. (2015) and the National Audubon Society (2015) identified the Osprey as a “climate-endangered” species because of a projected 79% loss of its current summer breeding range by 2080. Despite the expansion of the Florida population, it is uncertain how the species will respond to sea-level rise in coastal areas or find suitable habitat and food in its expanded range northward. Roberts (1932) pointed out that “aside from man, the Osprey’s chief enemy is the Bald Eagle.” He further speculates that “it may be difficult or impossible for the Osprey to maintain itself when the Eagle is abundant.” Bald Eagles have increased dramatically along with the Osprey. Recent phenological research at Hawk Ridge detected that Ospreys are migrating earlier, along with the Bald Eagle. Bald Eagles are pirates: they rob Ospreys of their fish and also prey upon Osprey nestlings. The interactions between these two species will be an interesting play to observe in the future, and the theater is here in the outdoors of Minnesota. Gillette, Laurence N., and Judy Voigt Englund. 1985. “The Hennepin County Park Reserve District’s Osprey Reintroduction Project.” Loon 57: 52–58. Martell, Mark S., Charles J. Henny, Peter E. Nye, and Matthew J. Solensky. 2001. “Fall Migration Routes, Timing, and Wintering Sites of North American Ospreys as Determined by Satellite Telemetry.” Condor 103: 715–724. Poole, Alan F., Rob O. Bierregaard, and Mark S. Martell. 2002. “Osprey (Pandion haliaetus).” The Birds of North America, edited by Alan F. Poole. Ithaca: Cornell Lab of Ornithology.